Club Penguin Cheats by Mimo777 Club Penguin Cheats by Mimo777: The Club Penguin Mine For Earth Day Party? But Why? 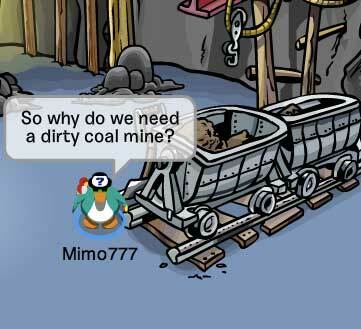 The Club Penguin Mine For Earth Day Party? But Why? So we don't celebrate traditional holidays on Club Penguin anymore. All those are replaced by Earth Day! So why do you think Club Penguin decided to start the Earth Day party at the Mine? Hmm. Ok so G is making a recycling center next to the mine and there will be a garden next to the mine but... What about the mine itself? COAL IS DIRTY! Coal comes from coal mines, right? So why do you think there IS a coal mine on Club Penguin island? Could it be coal is what fuels the entire island? All the lights and machines and stuff? Gary the Gadget Guy uses coal to make his inventions go? Ok, so Club Penguin and all us penguins need FUEL or ENERGY to make things fun on Club Penguin, but coal is dirty. So do you think the Mine will be PERMANENTLY REPLACED by another kind of energy room? Play some music on Franktown Rocks! Cool! Maybe the coal is all used to heat the boiler. Or it isn't coal, its just rocks. I don't know! They should clean out the mine! Ick! Maybe they will get Solar Panels! NO way! They are ruining the mine anough with he recycling plant thing. Go gray for pollution! XD JK but really I don't like the idea of the going green...Ya I know just by saying this it's like punting a baby seal. So if you're affended by me punting cute baby seals I am sorry. 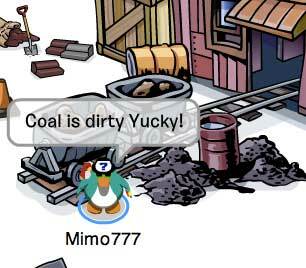 Nice find, Mimo777!And funny how you said "Coal is dirty yucky(Capitalize)! Well I think I know why the coal is in the Mine. Coal is used for running trains.The Mine has Cart Surfer and the carts are like mini trains. Then, you need the coal to run the train. I hope you like my theory. P.S. When is the party for your favorite spot in Club Penguin? THEROY!! ok coal is bad. but it could be that for earth day it could be temporarilly or permanantly replaced by being fueled by wood. wood is from trees right? so maby soon the garden will hold trees with a new game to find anc click as many trees as you can. so instead of mean old coal we will use wood! and then they can melt the iorn from the coal carts that are not used in cart surfing to make guters or a FOUNTAIN of water to water the garden automaticly! then some of the wood can also be used to heat some of the water in a pipe to heat the pool water in the pool! maybe they use the heat energy (or Solar Energy) to provide electricity in the Underground. that's why the lights are being on and off.. But, throwing snowballs? Hmm.. Club Penguin said, they will do something with the mine. Maybe they will clean it! or maybe, it's an cross-fertilized soil. (???) I hope this theory works! I think that Herbert and his seeds have something to do with the garden. I agree with you. I think the coal is used to heat the boiler too! I hope we will find out! This isn't about my theory BUT I really wanted to tell you. PLEASE READ! On level 1 there is an arrow on the first platform where you start. Well you go to that arrow and go down off the edge two steps, left 3 times, down twice, right 3 times and the down twice until you reach the platform. Collect the bag of 200 coins and go to the portal and you are back at the beginning of the level. The next portal is on level 4. Collect both puffles and stay on the 2nd puffle platform. From the arrow pointing outwards go 5 times right, go 6 times up, go 5 times left and then warp back to the beginning of the level. When you get up to level 7 you go down 10 times, right 4 times, 3 times down, left 5 times, down twice, right 3 times, down 3 times. Then go on to the platform and collect the coins and through the portal back to the beginning. Thats all I have so far but thanks for reading. Hope you liked it, Twinie 2.
a frisbee and goat store?!?!? ummm ok...LOL maybe the mine shoulde replaced by a cow farm, lol! I hope they don't permanently replace it. It's a historical site. They have had the mine since day one!!! they probably thought that the mine was really dirty and thought "maybe we can change it up and clean it down"
Why are you mad at Mimo? It's just a theory. Not to mention the fact that if it does become a reality it's not like it was Mimo's choice. Loook man. You like this rock-shaped piece of land, right? Ok then! You should probaly take care of it. I got a theory. You see that has been many earthquakes and Volcanic eruptions right? Yeah. That is Earth's way of saying "Help me! I am injurged!" Mostly you would believe that if you believe in 2012, but yeah I dont believe in 2012 but I still believe the theory. P.S. I hope this helps you go GREEN. Yeah but cutting down trees is actually BAD for the environment. Remember when Herbet dropped the pack of seeds? Yeah. Maybe they were magic beans. AND. He will plant them while nobody is looking and it will grow all the way up to the sky! Then the new mission will be about saving herbet from the GIANT and putting him on the iceburg back to Polar Bear land! actuall if any of u watch the disney channel they r having a big thing called ht big help to help save the earth so that is wat i think. earth day looks cool but is it. Hmmmm... Odd and slightly disturbing. What do you guys think of a grey mining hat that makes dead flowers when you drill? hmm that is a good point for us to think about..maybe it is used for energy, or maybe for the black colour for penguins! lol..that is too silly..i think it is used for energy. yes! it does produce carbon dioxide..so maybe it isnt for energy. or did they just create the mine for the game? hey, that maybe right. but i still dont get the the connection between the seeds and the garden..if you know what i mean. Wait!Mimo777!I found out what CPG means!! !It means the key is C:club,P:penguin,G:gang!! !So it spells out Club Penguin Gang!!! we didint make the mine remember?? Maybe they will use hamsters to power all the stuff in CP... Will Carl the Hamster be used to power club penguin? Who knows? Dont worry, It wont be replaced. coal is for ... well dunno. but it wont be replaced! the coal is for earth day I think! C'mon cheer up mate! I Think It Will Stay Just As It Is But With The Garden And Plants. Coal Might Be Dirty But It's Good For Our Planet. i think ur right, and i also think herbert is probably going to break that centre and use it for his plans. or even, he might want to turn this island into a hot island, as u can see in one of the mission11 sneaky peak, the one with a picture of a sunny beach. does this mean that we are not going to play cart surfer again? well, as u can see, in the puffle rescue, the pink puffle, the coal mine is actually VERY dangerous. mimo maybe it could be that it does fuel the island (the coal)and that herbert will try destroy the mine to put the island in turmoil or he takes over the mine and uses heat from the coal to melt the snow and make cp a tropical island like hes wanted all along! One word: HERBET. I have never seen club penguin celebrate Earth day before. It could just be me, but didn't we find a packet of SEEDS that herbet left behind in the last mission. That mission has been forgoten, hasn't it? Or is Herbet planning to plant some kind of weird magic seeds that will turn club penguin into a tropical island? Mimmo, you answer that. Hope not, i need to ask something. Will there be a Christmas party? cos if there isn't (being serious here) I WILL quit CP. Sorry but its political correctness to the EXTREME and if CP is gonna be like that, i don't wanna be part of it. Yeah, I think CP has messed it up a lil bit there. hey mimo i think it is reletead to the new mission -loda chod ke bachcha . Another thing, who cares about what coal is being used for. Concentrate on HERBET and his SEEDS. It HAS to have something in common. Think about it. Club penguin are waiting for a good opertunity to bring out a mission. Then they realize green day is comin' up. HERBET must be planning something. I KNOW! Mabye he's planning to use the recycled coal to heat up the boiler in the boiler room so much that club penguin will explode into a tropical island where he can eat fudge. Whatever happens I predict there will be tropical islands and fudge. That is all I can say to you penguins... GOODNIGHT EVERYBODY! WOOOOOOOOOOOO!!! Yeah, i know why your angry. I am too but please don't blame Mimo, he didn't have anything to do with it, he just blogged about it. Yes you could be very right there do you think that Herbert could be up to this? of course cp uses coal for energy for the whole island what do you think the boiler room is for? when are u having ur party??????? I don't think they would change the mine! because if they did, then the new underground areas wouldn't work, and the new game, the Pink puffle level is in the mine so that would have to change. Remember we did not make the mine we found it so am was there some sort of ancient Club Penguin? I think they are still keeping the mine, but turning it into a very nice place. I think they will get rid of the coal, and just have it in the actual cart surfer game, where you would mine for coal anyways. I think they are doing it in the mine because it is the dirtiest place in all of Club Penguin and they want to fix it up! I think they will either turn it into a greenhouse, but keep it as the mine, (with lots of plants inside and a glass roof) or just plant tons of stuffs outside and do something nice on the inside! Hey! That is a good idea! Well, yes, but don't you think it will give ppl ideas to go green? And why are you mad at Mimo? Same! Mimo said soon on Twitter! They better not get rid of coal, how are penguins supposed to grill fish if we have no coal?! Yeah, I hear people yelling to me, USE WOOD!! But that won't work, because Club Penguin is talking about planting trees, not destroying them! They are like the rest of the tree huggers out there, some people don't realize that after you cut down a bunch of trees, you can plant some more or they can replant themselves. OK here is my idea. Herbert likes warm places. Coal heats things. Also at the end of the last mission he had seeds. So he might be making some kind of tropical island, or it is a poisonous plant, or just melting CP. oh by the way i hope the mission isn't where they are all saying,"HERBERT save the earth" or any stupid go green stuff that is just dumb if they do that. Yeah, I agree with the mine but why hate MIMO he just posts he doesn't make cp. Mimo!To make a new room wouldn't they have to cut down more trees for more rooms? What if the mine carts are used to deliver rocks and soil for the plants? Mimo i guess that's a good idea but the mine is the most ungreen place on club penguin island and we wanted to help it go green without deleting the mine itself. The mine is still there and its getting a paint job, SO WHAT! no comments to mod? :( some one comment please! ..so bored..
DOWN W/ THE MINE! JK JK JK, hey Mimo, maybe CP's mine is clean and they dont use it anymore? maybe they have a secret wind plant which they will show us on earthday?! HAHA! I RULE! You are probably right that is a very very good theory thanks for sharing it with us. I'm pretty sure that the mine is a gold mine, not a coal mine. Why else can you dig up coins in the adjacent cave? they are probably going to throw away the coal and use garys idea! have something to do with the garden. Great idea! I agree with you! Herbert! He had that packet of seeds, we're planting plants! Also, he dressed up like a Yeti, as far as we know, and maybe he came from the new cave in the mine. There are seed packets in the mine shack, so maybe hes growing plants, to make energy, to make even MORE warmth! Coal is a main source for pollution which is probably why the put it at the mine. I thunk they should get a new game going on at the garden place. In some of the missions for secret agents G has solar panels! I think the island has a lot of solar energy. I think because coal is used for fire, it might be in a mission! I checked the caves and remembered the broken Aqua Grabber and the door to the ocean in the waterfall room. Maybe Herbert got in Aqua Grabber and crashed through that wall, making the hole, and maybe he crashed on that wall and was living there until we opened the cave. AND there was a puffle that would come out when it was just the rock slide. Remember a few missions ago, Herbert said something about our puffles. Well there you go. Yarr went missing and now there was the yellow puffle. Maybe Herbert trapped them and is hiding them somewhere. Somehow, i think the rockslide, the Aqua Grabber Vehicle, the hole, and this Earth Day Operation all fit in with Herbert! Last Segment to my Theory! I just looked at the Club Penguin Blob and looked at last weeks sneak peak. What is next to the Herbert Statue? A TREE! Whats happening at the mine? We are planting plants! Also in the sneak Peek, there is a shaft. Scroll down to later posts on the CP Blog and theres the three sneak peeks of Earth Day. Look at the one on the right. Its a machine. Where have you seen that machine? In the video game sneek peek! PS This is my huge theory about the video game and The PSA and the Earth Day Project. I have a feeling the new mission will be out REAL soon! NO!! your all wrong. The club penguin team is putting the room there because that is the only room where there is space to put something there.Not like the lighthouse where you have to cramp it in there. My friend Blabu and I made up our on theory that will not happen: Normally recycling leads to something like "global warning" (might be warming I never paid attention to that) so if CP believes in this doesn't that mean that they will melt? Then we will all have to get a pirate ship igloo and sail to Rockhopper island. Hey that made me think of something else what if Herbert sees a picture of Rockhopper island and then plans to stow away on Rockhoppers ship? It might not be a coal mine! What if it's a tin mine, or something else? It could be mining some strange ore that is only found on CP! One problem.. wood doesn't just grow on trees.. well it does, but you get the point. Wood is almost EQUALLY as bad as burning coal, because it still releases carbon dioxide into the atmosphere! Instead of that, why doesn't CP have wind turbines, or solar panels, or hydroelectric energy sources?Think about it, you can put solar panels on the beacon, and there is A TON of water around CP, so there are a lot of options! With all due respect, at this moment, no one cares about Herbert! Coal could potentially KILL ALL OF US! Unless Herbert is planting some trees with those seeds, he is irrevelant. YEAH! That's possible! Mimo has an excellent theory! That would be so cool if it was right! Awesome comment! You are a great moderator! Woo hoo! What a creative theory! It would take a looooong time!.. Right? WOW! You really worked hard on that comment! :O Cool! Wow, Tipski, you've got a amazing imagination! Remember when Mimo777 said Gary is gonna make it into a recycling centre? Well, the place could be ENOURMOUS! But Tipski, maybe they will change their mind! noOOOOOOOOOOOOOOOOOOOOO i hope they dont destroy the game there! Let's go Earth Day, lets go! (clap ,clap, clap) Let's go Earth Day, let's go! (Clap, clap, clap)JK. You don't have to be rude. It's just theories(duh). Theories are like predictions, not the actual answer.And, you said that we were stupid. one of Mimo's rules is"Don't be rude or negative". So there! Cool!Thx for the cheats.Lets hopeeople have read this comment and will be trying it out. Hmmm... you could be right,but as an anonymous person said 'I hope they don't permanently replace it. It's a historical site. They have had the mine since day one!!! '(By the way who ever wrote this don't use too many ! plz)He or she is right it is an historical site.I also hope that they don't destroy or replace the mine shack. What do you mean "not celebrate traditional holidays on club penguin"? Only the Easter Party was replaced by the earth day party. And I think the mine is just there to be awesome! There wouldn't be the cart surfers game, the puffle rescue game, or the caves without the mine! P.S I think a goat store would be AWESOME! xD! I think they should keep the mine but a another extention onto it because if we stop the mine the boiler won't heat anything and everyone likes the boiler! They use the mine to use the mine carts to safely and easily ship things underground and back up to the surface. So if you think it's a bad idea to have a mine listen to me:YOU ARE CRAZY!!! It's bcause of stupid Disney u no that friend for change thing their doing for the enviorment?? Yup all because of stupid Disney!!! Also I agree coal is icky but maybe were going to start using wood? Idk... Wait but coals used for heating stuff? Herbert!!!! Lol maybe he's trying to do something..
Their obviously not gonna get rid of all the coal because you know those two new rooms. Oh come on you know the caves? Yeah The walls look like coal maybe. So we obviously arent letting that go away. Cp would never take away a new room when it hasn't even been there for a year or 6 months. The coal is just so they can take it to the boiler room and thats why the boiler room is so close to the mine!duh! Solar Panels would be great! And yeah, maybe coal is used for the boiler room. I think they should not get rid of the Mine Shack, because then what about the underground cave? or the games? like Puffle Rescue or Cart Surfing? or the entrance to the underground pool? (well they are two ways to the pool). Maybe they are using the coal/dirt for the boiler room? or using the dirt for the garden? hm, who knows. Plus if they had things next to the Mine Shack then the place will be popular. Don't you think? Didn't CP say that they are gonna build a Recycling Center 'next' to the Mine Shack? I kno what you're saying Mimo. I want both. A mine cause of everything in it and a recycling center to be more "green"! No holiday parties anymore? Gasps! That's horrible! JK. Well in my countdown, there's only 5 more days until the Earth Day party! Woot. P.S. Sorry I haven't been moding that much. I had a birthday party, basketball, and watching T.V. Then my other friends came. So sorry.And I also have a Science Project due on Monday, so yeah. I'm pretty busy. You think to much mimo. LOL! No hard feelings dude. But I think we will have a green alternative fuel to the coal. G. Earthday. Herbert. Plants. Puffles. Mission. Mine. New Cave. Any ideas? remains of an old coal mine used for power a long, long time ago. They didn't know what to do with the coal once CP got clean energy so they just left it there. Cool theory. Mimo will probably make a post or tweet about his party. Feathergreen here again. I think GARY created the Mine for Cart Surfer, I heard it was first built in May 2006 for "underground purposes" so penguins can discover the underground. Plus, they would NEVER replace the Mine because 2 rooms connect there. The Underground Cave (pool) and the Cave Mine (the drilling room). Pus, everybody LOVES Cart Surfer! Who doesn't? It's one of the top ways to earn coins. do not get rid of the mine! cart surfer is the best moneymaker EVA! Herbet might turn the Mine into a coal power plant, and pollute Club penguin with Co2 (Carbon Dioxide), Co2 makes things warmer right? Well he might do that and make Club penguin warmer and spoil the earth day party!. P.S This is a made up by me, which means it could be true or not. hey in the last mission herbert had seeds or somthing in his hand maybe it has a connection! Calm ya farm mimo dude without coal we wouldnt have A. a toasty coffee shop B a toasty boiler room and C. the great warm lounge in nightclub so please mimo dont try to find too many things to complain about Good Gravy! Maybe the coal is for the boiler? Just a likley suggestion..
Its today. I dont know If I'm going to be one or not. lol. I spent alot of time with my family in Australia.